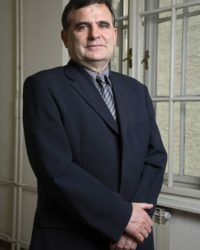 Vlado Šakić has been a scientific advisor and director of the Ivo Pilar Institute of Social Sciences in Croatia since 1998. He received his Ph.D. from the University of Zagreb in 1991 and he received the State Prize for Science (area of humanities) for the book Croatian Diaspora in 2005. His research is based in the field of social psychology and his main research interests include social identity, the psychology of migration, social deviation, and antisocial behavior. He has been a project leader of fifteen research projects and a project member of more than twenty projects. He is the author of five and editor of six books, author of ten scientific papers published in international journals, and more. Theories of Conflict and the New European Order, About Genocide and Other Forms of Group Violence, Youth’ s Social Identity – Socio-Psychological View, and Psychological Characteristics of Convicted Persons. A list of Vlado Šakić’s publications can be found here.